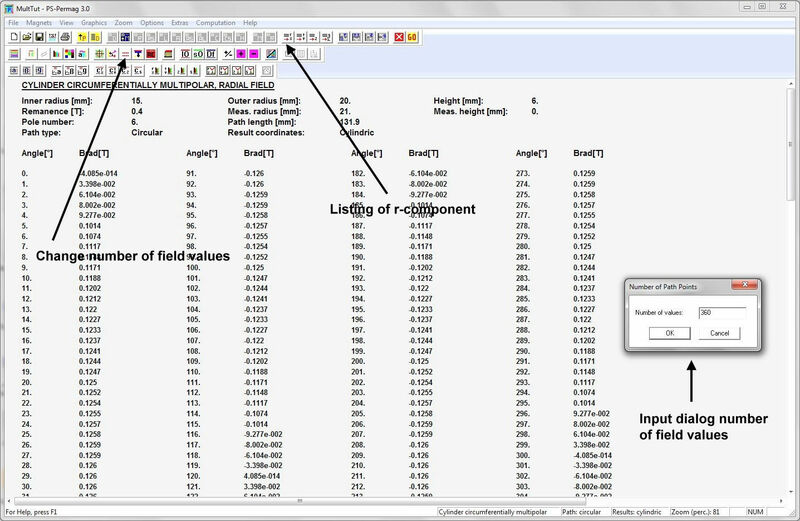 This tutorial teaches the basic methods to define problems, perform calculations and to get related results. Pictures shown here are from calculations with version 3.0, but of course the tutorial can be used without any change in version 3.1 too. 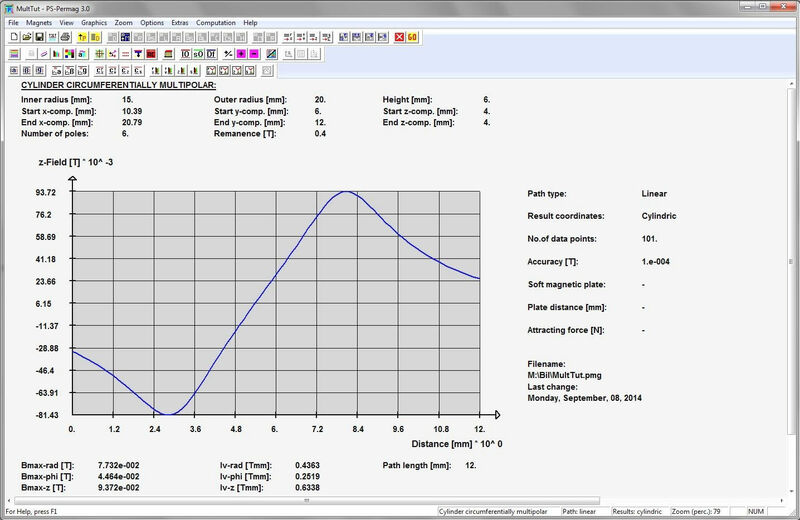 Tutorial 3.1 below is related to the new sorts of sensor magnets which have been introduced in version 3.1. After starting PS-PERMAG a 3D model of an illustrative permanent magnet shows up on the screen. To define the above described magnet please click on the M symbol at the top symbol bar. M stands for circumferentially magnetized multipolar cylinders with homogenous magnetization in each pole. This opens an input dialog for the data input, see picture below. Here the basic data of the magnet have to be put in. 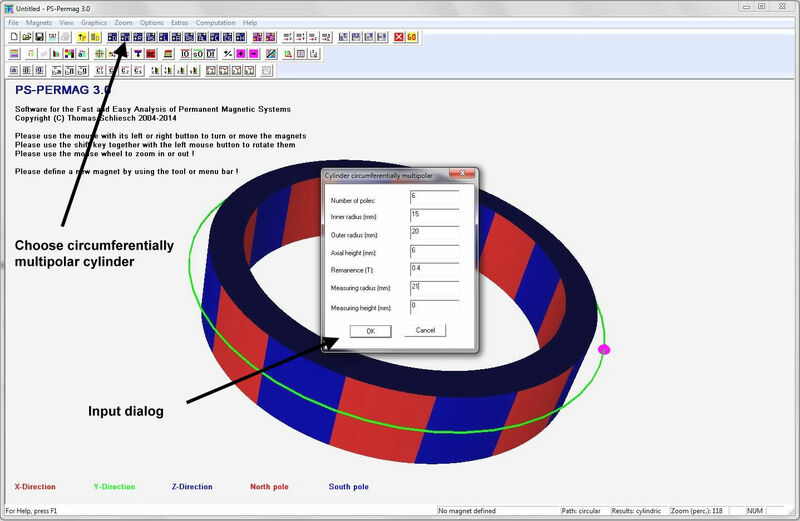 Background for defining a cylindrical magnet is always a cylindrical coordinate system. This means e.g. that at half the axial length of the magnet there is always z=0. At zero angle phi=0 there always starts an outward oriented pole. After you press OK the respective new 3D model shows up on the screen including the defined results path, see the picture below this text. You can zoom in or out of the model by using your mouse central wheel. By a left mouse click and simultaneous mouse movement one can turn the model around its x- or y-coordinate axis. 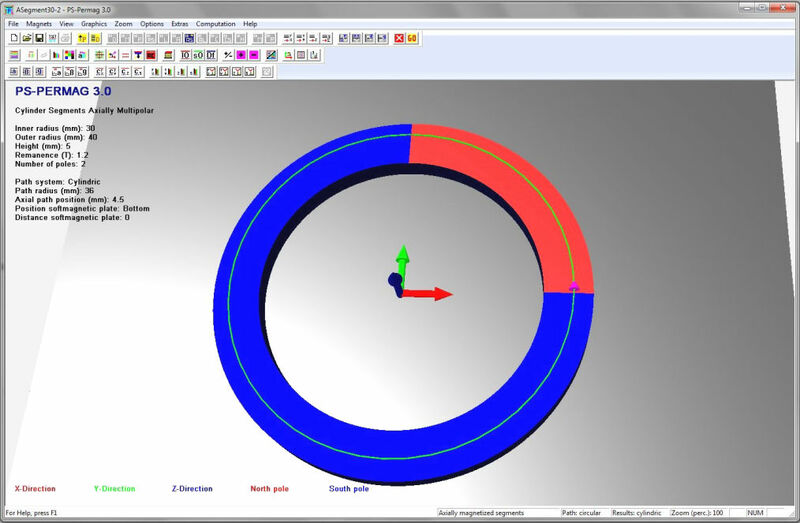 By a right click together with a mouse movement the model can be moved horizontally or vertically. Simultaneous left click and use of the shift key on your keyboard will let you turn the assembly around the z-axis. A general method to increase or decrease the screen contents may also be the use of the + or - button in the second symbol bar. By pressing one of them them beside the 3D magnet model also all other contents of the screen can be changed by size. With the help of the neighbored SO symbol respective zoom factors for texts and diagrams can be stored as defaults for any new calculations. By this it is possible to adjust the software to the users screen resolution. The coordinate system symbol you can switch on and off by the respective button in the second symbol bar. Please push now the GO-button to start the field calculations. After a few seconds they should be completed. The progress will be shown by a respective progress bar. Please push then the button to show a diagram for the results of the radial field component as indicated in the picture below by the arrow. The button there shows the letters r and x. The three neighbored buttons to the right stand for the other two field components as well as for the absolute field value. Now look onto your first results. These are the values of the radial field component as a function of the circular angle. Instead of using the full angular range it can be cut to a defined interval. To change the diagram please click on the respective button on the left side of the second row of symbols, see the picture below. By this an input dialog will open to let you change the start and stop angle. 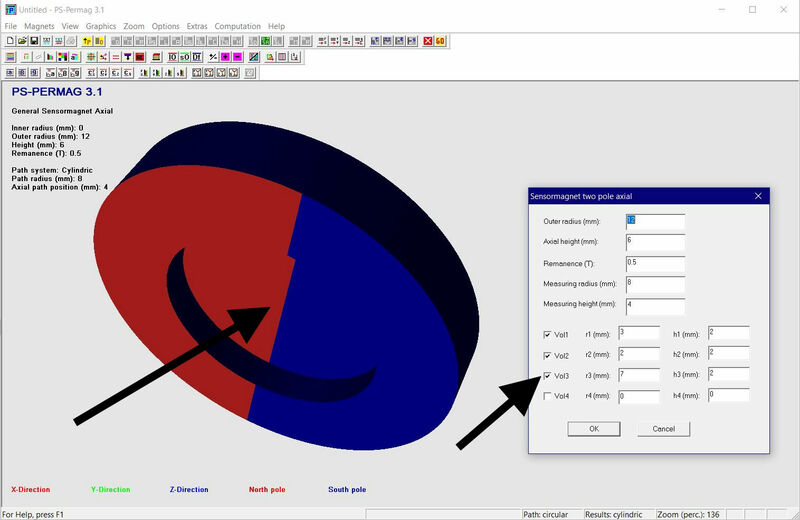 In case you want to return from the field diagram back to the 3D magnet model, please click the respective button in the right half of the second symbol bar. Right beside this button (here in grey) are three option buttons for the 3D model (Hide/Show coordinate triangle, Transparent magnet model, Default position). The fields can also be presented as numerical listings, which can be opened by clicking on the respective bright gray buttons in the first symbol bar. 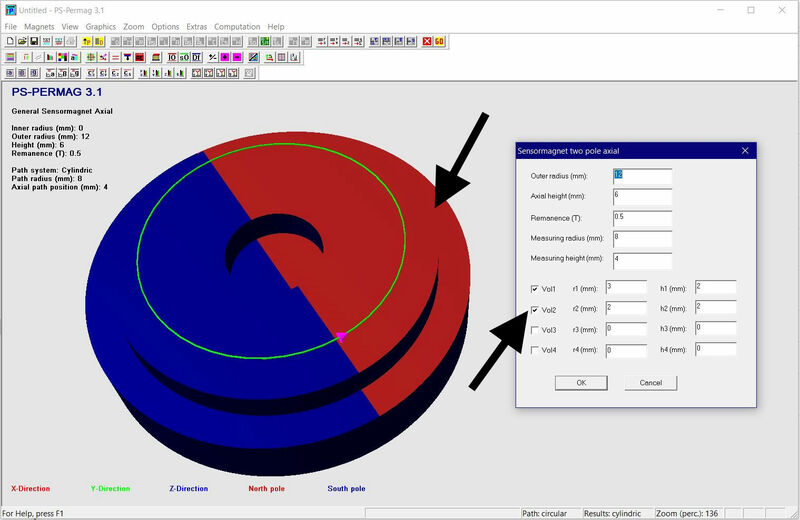 The first of these buttons opens the listing of the radial component when cylindrical result coordinates are used. For systems needing cartesian coordinates this button shows the x-component. Generally for cylindrical magnets by default a cylindrical coordinate system for the resulting components is applied. But for all kinds of magnets also cartesian coordinates can be chosen for the output. By clicking the button with the two doted lines in the options bar (second symbol bar) one can change the total number of values which PS-PERMAG computes on a chosen path. To finalize such change the computation has to be repeated by using the GO button. Additional calculations based on the single field components are e.g. Fourier series expansions. In case you would like to have an overview over the approximation of e.g. the radial field by such series, please click in the third bar (evaluation bar) and there on the first of the gray symbols in the last quad. Then the original curve together with its Fourier approximations up to specified grades are graphed. Below this is shown for the first two poles after having constricted the geometric diagram angle to 180deg. Which and how many grades are chosen for graphical depiction can be determined by clicking the first button of the second symbol bar. 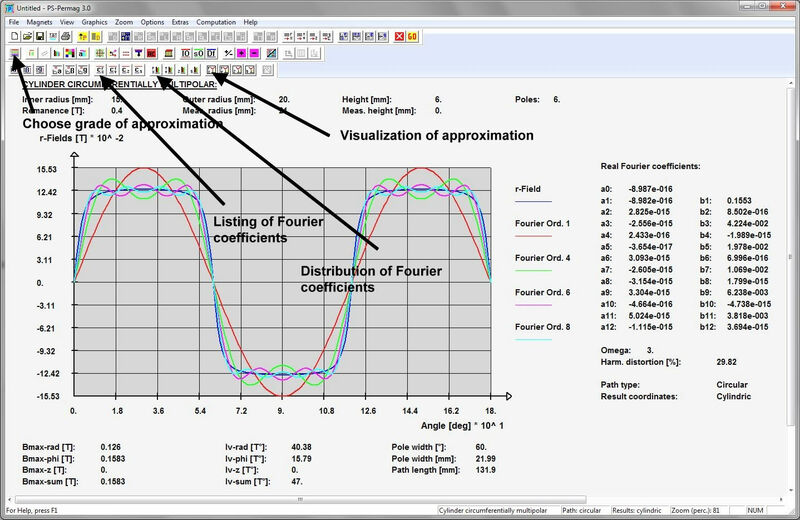 A listing of all numerical coefficients of the Fourier series can be shown for each single field component by clicking on the respective button with letter c in the third symbol bar, like shown below by the respective arrow. In addition the distribution of different wave orders can also be shown graphically by clicking the respective button in the second last quad of the third row of symbols. Another sort of evaluations are field angles which are of importance e.g. in sensor technology. In the evaluation bar (third row) a click on the respective button of the second triplet reveals these angles graphically. Below the angle of the field projection in the r-phi plane is shown. The buttons of the first triplet provide the respective numerical listings of these angles. All angles are defined between -180deg and +180deg. 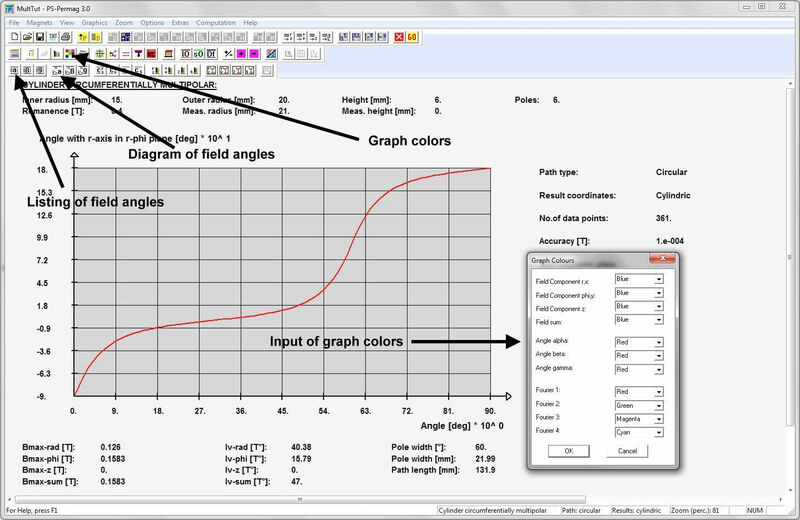 Graph colours can be chosen generally in the options bar as being shown by the respective button and its dialog mask below. 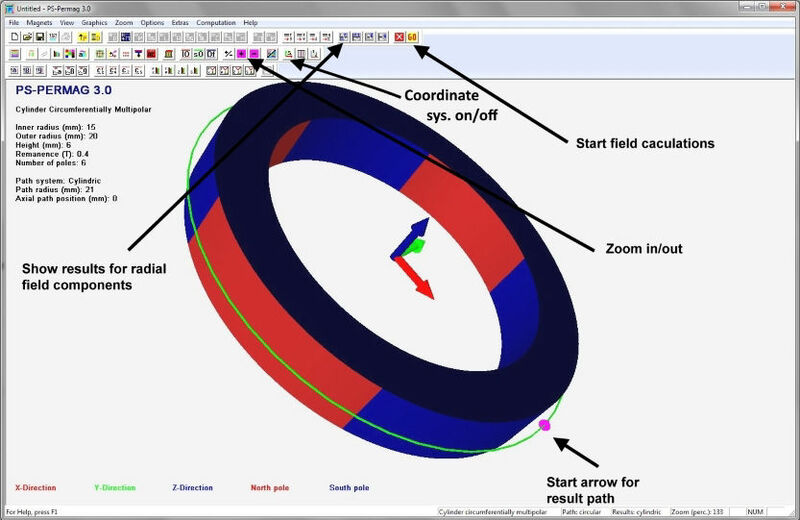 For field evaluation beside circular paths for all kinds of magnets also straight lined paths can be defined. In addition all results on all sorts of paths can be shown in cylindrical as well as in cartesian coordinates. In the picture below the respective buttons for the change of path geometry and also for the choice of result coordinates are marked by respective arrows. By choosing the button for defining a magnet after having switched to a linear path, an input dialog as shown below will open. 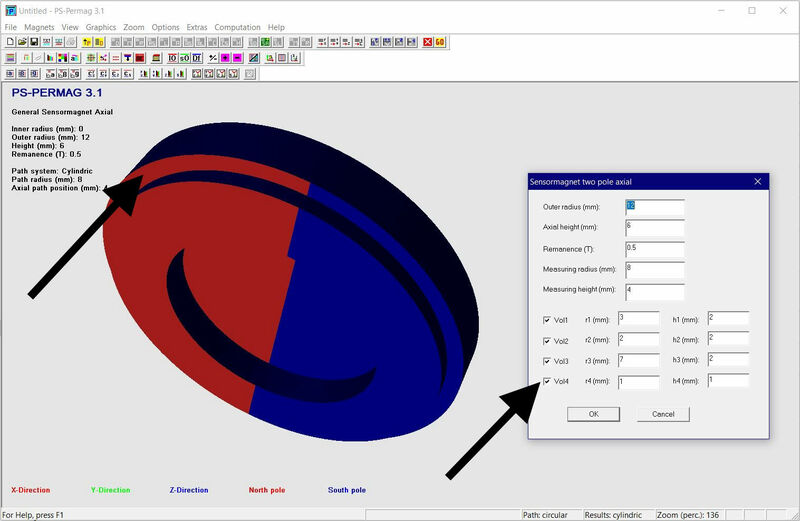 To display the 3D model as shown below again the switching button in the second symbol bar is to be used. The linear path is displayed by a green line. In the case below the linear path shall run 1mm above the center of the first pole, starting at a radius of 12mm and ending at 24mm. 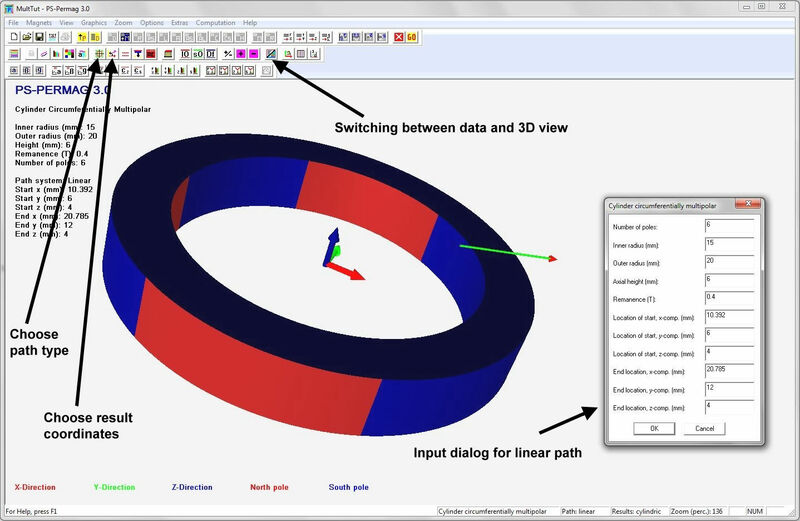 Due to the input dialog linear paths are always defined by their cartesian coordinates of start and end point locations. Because the center of the first pole is located at 30° here, and as the axial length of the magnet is defined as hm=6mm, the following coordinates for the start point location have to be put in: x=12*cos(30)=10.392, y=12*sin(30)=6.0,z=hm/2+1=4.0. The respective figures for the end of the linear path are: x=24*cos(30)=20.785, y=24*sin(30)=12.0, z=hm/2+1=4.0. After finishing the input dialog the computation has to be started by use of the Go button. In the next screenshot we show the result of the x component of the field after a problem definition on a linear path like in the picture above. The result coordinate system has been switched to cartesian coordinates here. Because we have a straight line path the results are shown as a function of distance. To close this tutorial some additional features should be mentioned: In the first symbol bar a dialog can be chosen to put in your own text of a description of the analysis. Beside the common binary storage of the analysis, which does not only include all primary and secondary results but also the most current user adjustments of the software, in addition an ASCII file of the field values by using the “txt” button can be written. Another button of importance is the red button close to the “Go” symbol, which lets you stop a current computation. The options bar, in addition to its already mentioned features, also provides features like changing the accuracy of computation or entering and storing your personal data, which will then always be shown on the detailed printouts of PS-PERMAG. The size of the screen view can be adjusted to your demands using the + and - buttons. 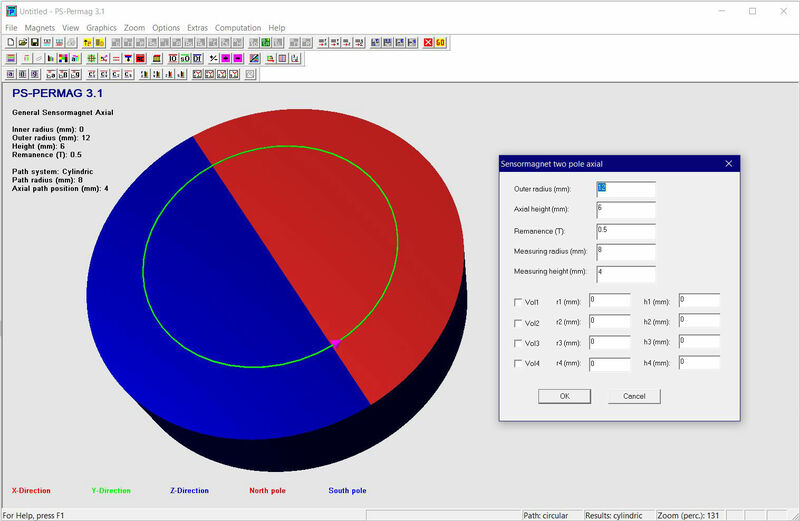 Additionally a specific button in the options bar opens a dialog which lets you adjust subjects like the thickness of letters or diagram curves or the visibility of diagram grids. Three sorts of option buttons handle the storage and recover of the user adjustments of the software. Not to forget: All features, which are usable by the above described buttons, can also be used by clicking on their respective menu commands, which are included in the main menu bar on top of the program window. Additional features of the software can be learned easily by use of its extensive help system. 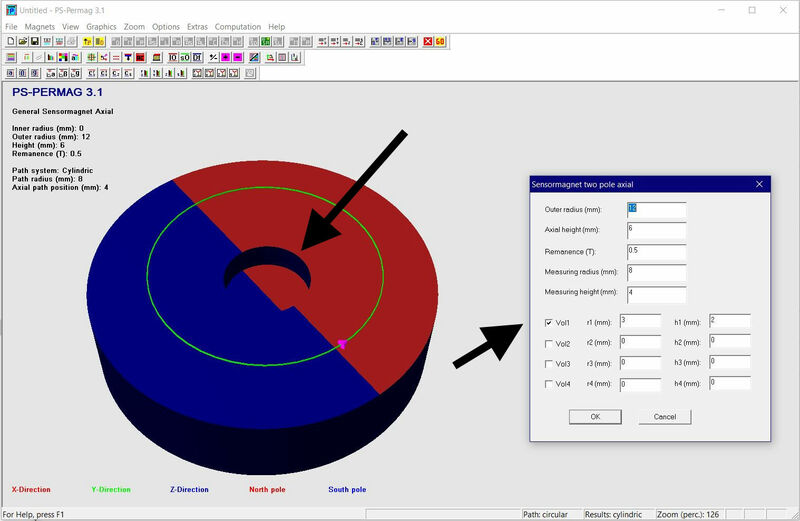 This tutorial shows the geometry input of the new sorts of two pole sensormagnets with depression and ledges, which have been added in PS-PERMAG version 3.1. 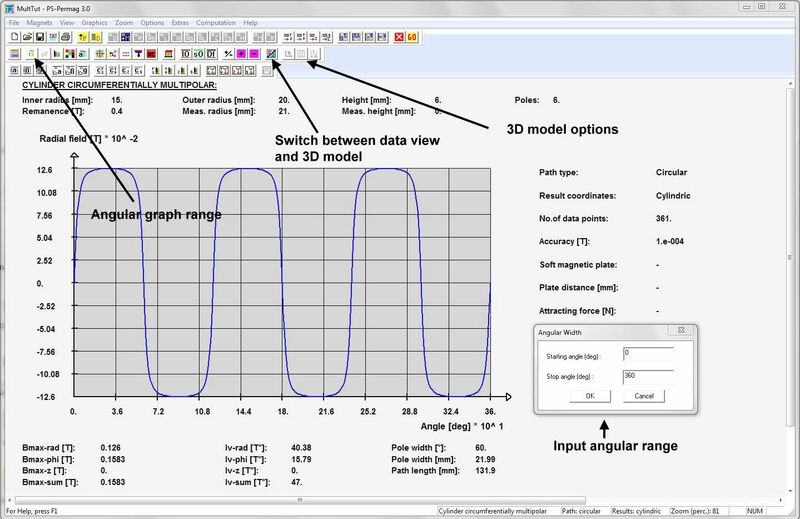 The basic use of PS-PERMAG can be studied in Tutorial 3.0. The following treats a two pole, axially magnetized sensormagnet. The geometry input of the other two new sorts of magnets, i.e. two pole diametrical and two pole axial-lateral, has to be done by the same way. First there has to be defined a basic cylinder. Depressions and ledges will be subtracted from this basic cylinder by up to four additional help volumes. A depression on the magnets top face can be defined by the input of radius and height of help volume V1, which will be subtracted from the basic cylinder, see next picture. If a ledge on the outside of the top face is needed, help volume V2 can be used. The radius r2 here stands for the radial depth of the ledge beginning at the outside of the basic cylinder, see the next picture. Finally another ledge can be built also at the bottom face, here with volume V4. The radius again stands for the radial length starting at the outer circumference of the basic cylinder.